Smoothies are one of the best summer treats around! Not only are they an easy way to pack your kid’s diet with fruits and veggies, they’re also refreshing on hot summer days. 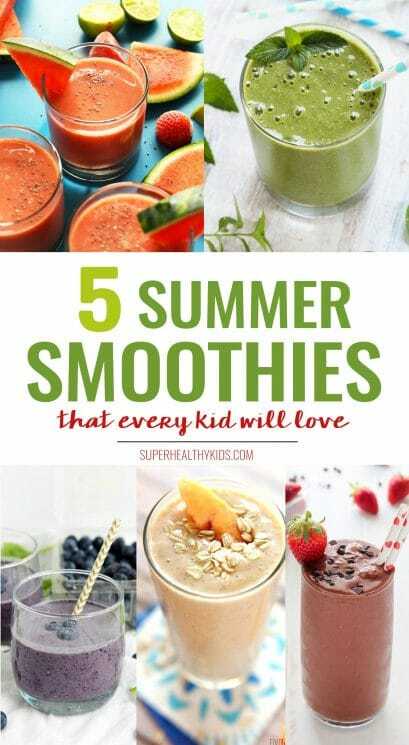 Today we’ve pulled together five of our absolutely favorite kid-friendly summer smoothies to give you a bit of inspiration as you look at all the fresh produce that comes into season this time of year. 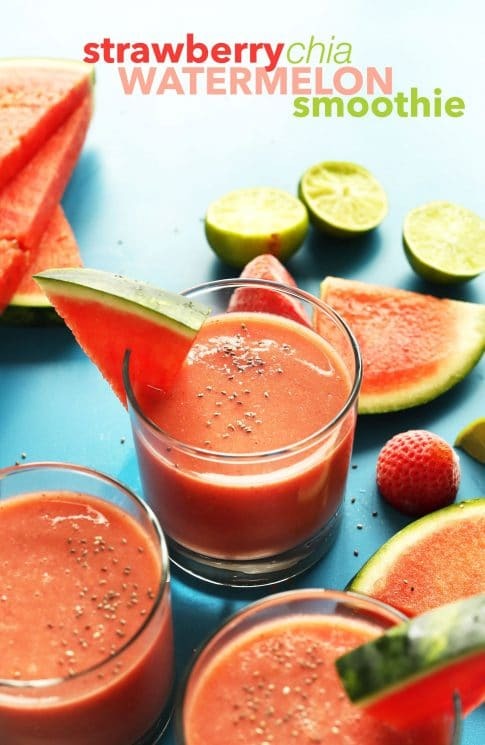 From juicy berries, to succulent peaches and refreshing melons, there is sure to be a smoothie here for every type of pallet. This smoothie just screams summer! With juicy strawberries and luscious watermelon, it’s a perfect way beverage to serve on a hot summer day. Plus, with the addition of omega-3 rich chia seeds, you not only get a thick and creamy texture, but you can also easily slip in some brain-boosting nutrients. This smoothie is will delight both kids and adults alike! If your kids have a sweet tooth that’s hard to curb, this smoothie is perfect. Not only does it use loads of fresh summery produce, but it tastes like peach cobbler. And I love that it uses oats! It’s a great way to make your smoothie super thick, but also add in loads of dietary fiber and a bit of protein. I’d recommend swapping the vanilla yogurt for plain greek yogurt to cut down on the sugar, and if you can’t eat dairy you can just swap in your favorite non-dairy alternatives. Dessert for breakfast never sounded so good! This is a light and refreshing green smoothie that combines juicy summer melon with fresh mint. It’s the perfect smoothie to sip in the afternoon and is packed with energizing fruits and veggies. There’s also a few superfoods inside – like flax and chia – which make this already delicious smoothie even better! If your kiddos aren’t a big fan of mint, feel free to add just a few leaves or you can even leave it out completely! What kid doesn’t love a chocolate shake? Instead of starting their days with a crazy sugar rush, let your kiddos sip on this healthy chocolate covered strawberry smoothie. They’ll think they’re drinking something that tastes like dessert, but you’ll be confident knowing you’re fueling their body with vitamins, minerals and antioxidants. Plus, since strawberries are in season, this is a great way to celebrate these lovely red berries! Talk about a power-packed smoothie! This one is loaded with antioxidants, healthy fats, omega-3s AND dark leafy greens! But don’t worry…those kids of yours will never know it’s healthy. Because it uses coconut milk, the smoothie has a wonderfully creamy texture, but also makes it friendly for anyone who is sensitive to dairy! And I love that since the blueberries have such a strong color, you’d never even know there was spinach inside. Almost reminds me of a blueberry muffin, but SO much healthier!